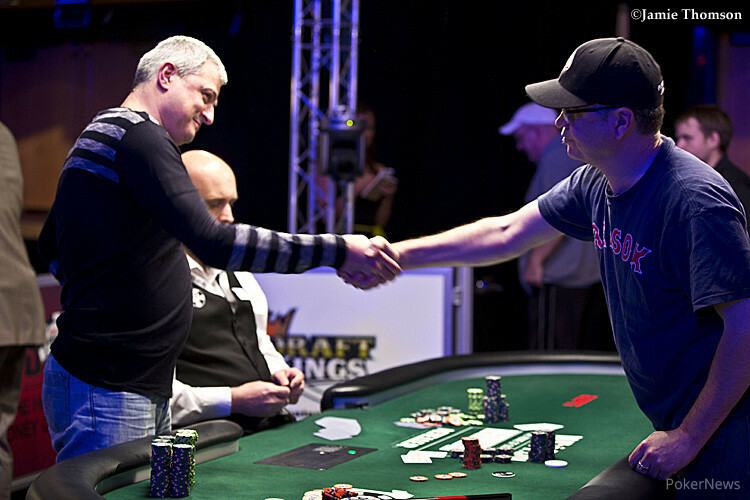 The last final table of this summer's World Series of Poker has come to a conclusion. It was Igor Dubinskyy from the Ukraine who emerged victorious after he hit a straight on the river to best Ted Driscoll's trip threes. Dubinskyy, whose best previous cash in a tournament was a 192nd place finish at the 2013 WSOP Main Event, would take home an impressive $637,539 first-place prize as well as his first WSOP bracelet. 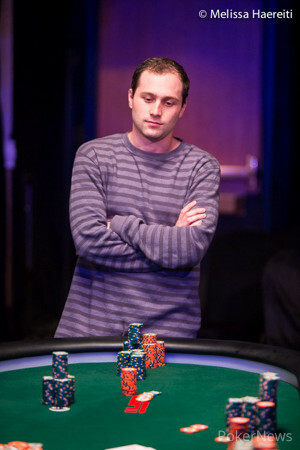 Driscoll would take comfort in an excellent second-place finish and a nice, tidy sum of $394,281. The day started with nine players vying for the title that Dubinskyy would eventually claim. 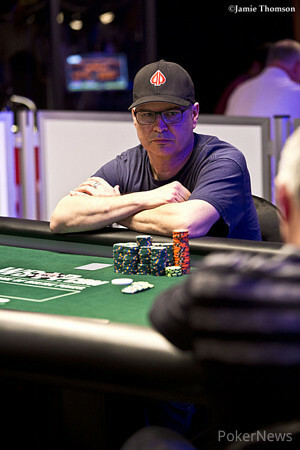 Most notable was WSOP bracelet winner Eric "basebaldy" Baldwin who entered the day second in chips. Baldwin would get off to a rough start, sliding down the chip counts early on, but would gain some momentum when he doubled up with pocket kings against Driscoll. He'd eventually find himself short and would move all in with pocket deuces from the small blind at the wrong time as Brandon Eisen woke up with queens in the big blind to eliminate Baldwin in fifth place for $156,532. Jack Duong would start the day with the chip lead but could never get anything going and would be eliminated in sixth-place for $117,507. Brandon Eisen would be eliminated in shocking fashion when he moved all in with the board showing with and found a call from Driscoll who held . Driscoll had probably been hoping his diamond draw was live but it turned out he could only bust Eisen with a non-diamond king, deuce, or ten. The river would deliver one of those cards to him, the , and a stunned Eisen had to settle for third place and $283,895. A total of 4,496 entrants took part in this event that would see an impressive $499,056 raised for the One Drop charity. After the two starting days, only 885 players would return for the Day 2 action. James McManus, Rep Porter, Ronnie Bardah, Maria Ho and Keven Stammen were just a few of the players failing to advance. The top 468 players would make the money and would hit that point midway through Day 2. By the end of the night, only 102 players remained and Dan Heimiller, Amanda Musumeci, Carlos Mortensen, Shannon Shorr, Matt Glantz, Olivier Busquet, Jared Hamby, Antonio Esfandiari, Justin Young, Will Failla and Humberto Brenes would be among the fallen who would cash, but fail to make it through to Day 3. Day 3 action saw the field whittled down to the final table of nine players. Falling along the way were many notables including James Woods (93rd - $4,167), Leo Wolpert (84th - $4,936), Tony Cousineau (81st - $5,907), David Paredes (53rd - $10,520), Brett Shaffer (23rd - $19,948), Xiao Peng (18th - $25,087), Michael Tureniec (15th - $31,804) and Kevin Eyster (10th - $40,666). This concludes our coverage of Event #62 and we thank you for following along. All eyes will now shift to the Main Event where a huge field is expected to turnout on Monday. Tune in to PokerNews for all the exciting Main Event coverage! Hand #162: Theodore Driscoll limped from the small blind and Igor Dubinskyy checked his option from the big to see a flop of . Both players checked, and Dubinskyy led out for 500,000 on the turn. Driscoll called and the completed the board on the river. Dubinskyy slowed down with a check, and Driscoll used two fists to slide out a bet of 1 million. Dubinskyy waited a few moments before check-raising to 2.4 million, and Driscoll responded by moving all in for 3.315 million. Dubinskyy shot up out of his chair and asked how much more it was. When he learned it wasn't too much more, the man from Ukraine called. Driscoll confidently tabled the for flopped trips, but it was no good as Dubinskyy had rivered the straight with the . Hand #157: Ted Driscoll received a walk in his big blind. Hand #158: Driscoll raised to 490,000 and Dubinskyy folded. Hand #159: Dubinskyy raised to 500,000 and Driscoll folded. Hand #160: Driscoll raised to 595,000, Dubinskyy reraised to 1,500,000 and Driscoll folded. Hand #161: Dubinskyy completed the small blind, Driscoll checked his option and the flop came . Driscoll check-called a 400,000 bet from Dubinskyy and the two would check the turn. On the river, Driscoll led out for 475,000 and Dubinskyy called. Driscoll showed a bluff with and Dubinskyy would take the pot with for two pair, queens and threes. Dubinskyy had approximately a 4:1 chip lead after the hand. Hand #151: Igor Dubinskyy raised to 425,000, Theodore Driscoll called, and the flop came down . Driscoll checked and then folded when Dubinskyy bet 525,000. Hand #152: Driscoll raised to 425,000 and won the pot. Hand #153: Dubinskyy limped the small blind and then folded when Driscoll exercised his option to raise to 575,000. Hand #154: Driscoll raised to 550,000 and Dubinskyy folded. Hand #155: Dubinskyy raised to 425,000, Driscoll called and the flop came down . Both players checked, as they did on the turn, and the completed the board on the river. Driscoll bet 300,000 and Dubinskyy called. Driscoll tabled the for a rivered pair, but it was no good as Dubinskyy held the for jacks. Hand #156: Driscoll limped from the small blind, Dubinskyy checked his option, and the flop fell , which they both checked. Dubinskyy check-called a bet of 300,000 on the turn, and then check-folded to a bet of 625,000 on the river. Hand #146: Ted Driscoll called from the small blind, Igor Dubinskyy raised to 600,000 and Driscoll folded. Hand #147: Dubinskyy called from the small blind and Driscoll checked his option. The flop came and both players checked. The turn was the and Driscoll bet 350,000 and Dubinskyy called. The river was the and both players checked. Driscoll showed for king high and Dubinskyy would take the pot with for a pair of threes. Hand #148: Driscoll limped in from the small blind, Dubinskyy raised to 600,000 and Driscoll called. The flop came and both players checked. The turn was the and Dubinskyy bet 500,000 and Driscoll called. The river was the and Dubinskyy bet an even 1,000,000 and after thinking for nearly a minute, Driscoll called. Dubinskyy showed for a set of eights and Driscoll mucked, telling Dubinskyy "I had some of that." Not enough though and Dubinskyy moved into the chip lead. Hand #149: Dubinskyy opened for 450,000, Driscoll called and the flop was . Driscoll check-folded to Dubinskyy's 600,00 bet. Hand #150: Driscoll raised to 425,000 and Dubinskyy called. The flop came and Driscoll would take down the pot with a bet of 550,000. Hand #141: Theodore Driscoll raised to 425,000 from the button and won the pot. Hand #142: Igor Dubinskyy opened for 425,000 from the button and Driscoll called from the big blind to see a flop of , which they both checked. Dubinskyy then called a bet of 525,000 on the turn before Driscoll fired out 900,000 on the river. "Queen high," Driscoll said after Dubinskyy called. Driscoll then showed the before Dubinskyy rolled over the for the win. Hand #143: Driscoll limped the small blind, Dubinskyy checked his option from the big, and it was heads-up action to the flop. Both players checked, and then Driscoll check-folded to a bet of 300,000 on the turn. Hand #144: Driscoll raised to 425,000 on the button and won the pot. Hand #145: Eisen limped the small blind and Driscoll checked his option from the big to see a flop of . Eisen led out for 200,000, Driscoll called, and the dealer burned and turned the . This time Eisen checked, and Driscoll bet 550,000. Eisen responded by moving all in for 3.335 million, and Driscoll hit the tank. "I imagine you don't care either way," Driscoll said. A minute or two later he made the call. Eisen and his rail were shocked to see that he was ahead with the better diamond draw, but Driscoll was still drawing live to a king and non-diamond deuce or ten. Much to Eisen's dismay, the spiked on the river to give Driscoll a winning pair of deuces. Eisen was clearly disappointed and had to settle for third place and $283,895. 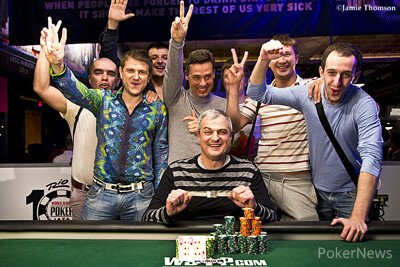 Hand #136: Igor Dubinskyy opened to 425,000 and won the blinds and antes. Hand #137: Brandon Eisen opened to 480,000 and Ted Driscoll reraised to 1,500,000. Eisen folded and Driscoll won the pot. Hand #138: Eisen received a walk. Hand #139: Dubinskyy raised to 425,000 and won the blinds and antes. Hand #140: Driscoll raised to 480,000 and Dubinskyy reraised to 1,200,000. Driscoll folded. Hand #131: Theodore Driscoll limped from the small blind, Igor Dubinskyy checked his option from the big, and the flop came down . Driscoll led out for 360,000 and Dubinskyy folded. Hand #132: Brandon Eisen received a walk. Hand #133: Dubinskyy raised to 400,000 from the button and Driscoll called from the big blind to see a flop of . Driscoll check-called a bet of 500,000 and both players checked the turn. When the completed the board on the river, Driscoll bet 800,000 and Dubinskyy folded. Driscoll then flashed the . Hand #134: Eisen raised to 480,000 from the button and folded when Driscoll moved all in from the small blind. Hand #135: Driscoll raised to 425,000 from the button and Eisen defended from the big blind. Both players checked the flop, and Eisen check-folded to a bet of 600,000 on the turn.